Speed Queen is a century-old brand of American origin. Today at the head of an international network of designer laundries, Speed Queen is for everyone, including travelers who have taken a vacation rental. Before selecting your holiday apartment, check that it is located close to all amenities: supermarkets, pharmacies, metro, laundries… To improve visitor experience, Speed Queen laundry facilities are often located in the heart of the city, in well-served, commercial neighborhoods. In this article, you will discover the benefits of washing at a laundromat, the scope of the Speed Queen network and the intuitive operation of its ultramodern machines. Why do your laundry at a laundromat? Laundromats enable you to wash up to 20 kg of laundry at once and to dry your clothes in a very short time. A complete washing & drying cycle lasts only an hour. A domestic machine does not dry the clothes and can only wash 5 to 7 kg of laundry in 2 hours. So you save time. During the wash cycle, you can take the time to go for coffee or a stroll in the surrounding area. If your stay will last several weeks, we recommend that you take a small suitcase and do a washing at a laundry halfway through your stay. You’ll travel lighter and you won’t have to check-in an unnecessary, extra suitcase at the airport. Another advantage of Speed Queen laundries: value for money. For a modest price (rates are given on our laundry factsheets), you get the best available service on the market: high quality and environmentally friendly washing and drying. Every year, Speed Queen designs top performance, professional machines, which consume less water and energy. Speed Queen can be found all over the world and accounts for more than 70,000 laundromats. This international network enables Speed Queen to offer the exact same quality of service to travelers, whatever their destination. Our laundries in Paris: we can be found in the 11th (metro Saint-Maur, not far from the Père Lachaise), the 15th (between metros La Motte-Picquet-Grenelle and Bir Hakeim), the 16th (metro Chardon Lagache, close to the Park Saint Perine) and the 17th (metro Porte de Champeret) arrondissements. Our laundries in Barcelona: a new laundry opened not far from the Passeig Sant Joan (metro Verdaguer), a pedestrian lane in the heart of Barcelona, close to the District of Gracia and near all the amenities necessary for your stay. You can find all our laundries with the Store Locator, including rates, opening hours, machine capacity and washing tips for all those small, travel contingencies. Our laundries in Madrid: we have opened several laundries in Madrid in the Chamartín (metro Tetuan) neighborhood, at Atocha (metro Palos de la Frontiera), Moncloa and Arganzuela. Speed Queen is also present in Valencia, Badajoz, Seville, Granada, Malaga and Las Palmas de Gran Canaria! Looking for a holiday rental in Spain? We are there to welcome you! Our laundry in Rome: If you have rented an apartment in the Jonio neighborhood, please note that a Speed Queen laundry just opened in Via Giovanni Conti. 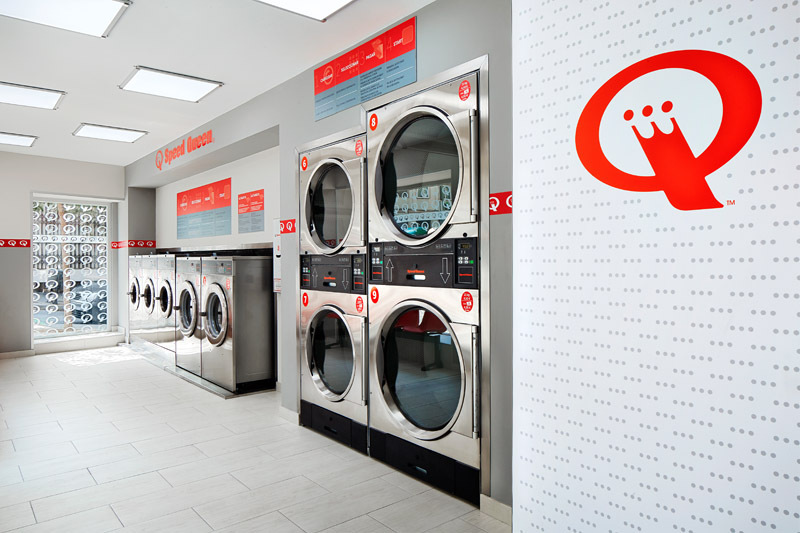 Since its European launch, the Speed Queen laundry concept has experienced strong growth: more than 200 laundromats have opened in large European cities! How do our laundromats work? You select temperature: “Very hot” for white cotton, “hot” for synthetic, “cold” for delicates. You start the program from the payment center! It’s as simple as that! Regardless of your travel destination, whichever Speed Queen laundry you use, you can be sure of finding the same quality of service, the same mode of operation and the same results. SPEED QUEEN IS HEADING FOR VIET NAM!